Bad feeling in the pit of my stomach - Mac Pro line may end at WWDC? Discussion in 'Mac Pro' started by Lil Chillbil, May 30, 2013. Maybe so but the specs are pretty easy to duplicate. Your own personal Pro can be made. Well Tim Cook has already said that a new Mac Pro is coming this year... So don't get upset just yet. I doubt that the Mac Daddy is going to pass so quickly. Even if it does, mine will serve me for many years. No he said, something for pros in 2013. Doesn't mean a Mac Pro. Shouldn't it be a zombie Steve Jobs? I looked online for a photo, but no one got it right. Someone should have taken the old one where he's holding an Apple and replace it with a brain. This WWDC will tell the future of Apple. If they can't pull a rabbit out of their hat they are done. I don't have high hopes either Chilbil. It could be the happy days are here again. OR DOOMER MONDAY. or Black Monday to some of my associates. Either way see you all in 10 days. I don't recall a time Apple has ever shipped something when people where expecting they would ship it, or shipped something that had every feature people were expecting. So I wouldn't get your hopes up. But it's been like this since the original Mac Pro didn't support PC graphics cards or SLI. - Apple may or may not announce something at WWDC. Even though nothing is expected until the second half of this year, people will once again complain about how Apple has "laughed in the face of pro users" and that "Apple doesn't care about pros" by not mentioning the Mac Pro at WWDC. Again, even though nothing is expected until the second half of this year, we'll have to go through all this over again as everyone works through their leftover trauma from the last WWDC... Some people will claim that no mention of the Mac Pro at WWDC is another sign the Mac Pro is dead. - Apple will eventually release something that is intended to replace the Mac Pro. For some people, it will fit perfectly into their workflow and they'll be happy. - Other people will be extremely upset Apple cut some feature from the existing Mac Pro, or didn't add the feature they wanted. Everyone will threaten to buy a PC for the thousandeth time. Angry letters to Tim Cook will be dispatched. Online petitions will be made. There will be complaining about how the Mac has been "iOS'ified." Everyone will forget Apple has been pulling this sort of thing for years, like when they shipped a Power Mac G3 that would corrupt drives bigger than 10 gigabytes. There will be complaining about how everyone wishes the old Apple was back so people could keep using their tape decks with Final Cut Pro over Firewire. 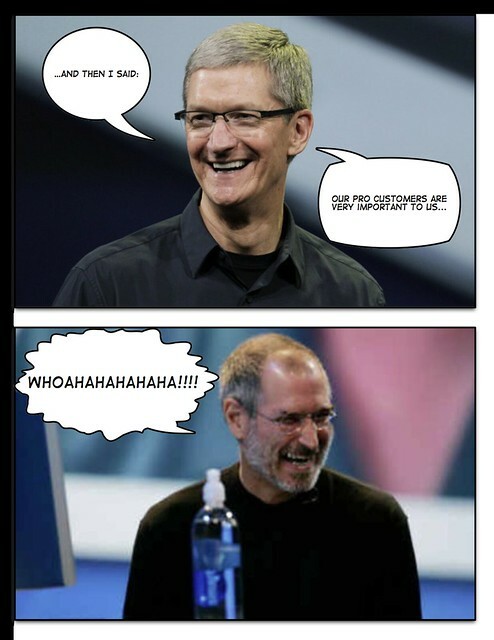 Whatever Apple releases, this is what is going to happen. iPods in September, pre-holiday season, window is like clockwork for almost 10 years. New Macs have been like clockwork in June/July for last several years. Intel is on a somewhat regular schedule ( relatively early roadmaps are typically by a quarter but even that error bar is almost predictable). That puts at least some Macs at a midyear release point. Which specific Mac has varied a bit but some Mac has been pretty regular in June for a while. iOS and now OS X updates are relatively predicatble with +/- two months or so. Again they are being anchored WWDC and Apple's move to incremental deployment software development methodology. Yearly drops with incremental updates and less "big bang" 18-24 month updates. Expected by whom? Pretty sure EU customers expected there would be a Mac Pro for sale this time of year. Apple is actually way off expectations. That is way there is more than usual moaning and groaning then normal about Mac Pro product management.... because it is whacked. It is way, way off for a normal Apple product. people will once again complain about how Apple has "laughed in the face of pro users" and that "Apple doesn't care about pros" by not mentioning the Mac Pro at WWDC. Sure lots of that is just as predictable as iPod refresh dog and pony show in September. What if they had a system called "The Mac". i7 based, user expandable, lots of effort put into low power consumption, then above that, the Mac Pro, a Xeon based multi-CPU equivalent with a higher price tag? That would suit a LOT of people where the void between the £750 BTO Mac Mini and the £2099 Mac Pro has nothing but a giant, feature lacking, glued together, non user upgradable laptop for your desk. Xeon versus i7 doesn't drive any price points. If match basic performance the i7 options largely approximately the same basic price points as the Xeon options. ( E3 roughly equivlaent to mainstream Core i5-i7 offerings. Top end Core i7 offerings being equivalent to E5 1600 ones ). The power saving is far more motivated on the mainstream offerings being on new architecture and process ( v3 , Haswell) as the others being on older ( v2 , Ivy Bridge). All of Intel's CPU offerings are getting more power effiecient over time. Picking a specific line doesn't do all that much more than another. It is different parallel performance points selecting. There is no void there. It is filled by the iMac. Can hand wave as it doesn't exist but it does. Relative to how many do match to the iMac there is not "a LOT" of people in that gap. There is constant moaning and groaning but there is little unbiased quantitative evidence that this is large. The is a gap Apple could close between upper end iMac ($1999) and entry Mac Pro ( $2,499) but all the way down to the mini... there isn't an empty gap. Keep kidding yourself (And maybe get some English lessons so getting your non-point across doesn't sound even worse). For the entire G3 to G5 range BEFORE they switched to Intel chips there was always an entry level, expandable desktop system and at the same time, a Cube/Mac Mini and some flavour of iMac in the "MID range". When they switched to Intel there was the Mac Pro with dual 2.66Ghz CPUs at £1699 and a built to order model with dual 2Ghz CPUs that "Filled the void" with a lower price tag of £1499. There IS a void, you're just ignoring it and towing the Apple marketing party line by denying it exists. Component costs such as RAM and hard drives/SSDs are peanuts these days compared to what they used to be, there's no excuse for only having closed systems with at most, user RAM expansion unless you have £2,099 and want a system that consumes serious electricity to offer negligible performance over a £750 system at the entry level. 1998 market was totally different than the micro device hard-on the industry has now. Watch the slopping desktop sales charts. Why would they cannibalize iMac sales? A desktop i7 sans display is an apology from Apple for the iMac. They should apologize and I'd love expandability but it most likely will not happen. They are moving to more closed not more open. Look at the retina and the new inability to upgrade your own memory in their consumer desktop model. I agree that there is as hole in the product line but it a hole Apple created intentionally. I don't see them closing it anytime soon. I think the need for internal expansion in a computer chassis is going away with Thundebolt and USB3. The only thing the current iMac can't best on the Mac Pro is the dual CPU option and lets be honest: the software that can fully utilize that and the number of buyers that are willing and able to pay for that imply that's a tiny niche market at best. I'm leaning towards an iMac for my next system and thanks to the tremendous value they pack into that system, I will be able to justify a replacement cycle of 2 years vs 4 years for the Mac Pro and as a result, I'll probably be better off performance wise overall (certainly during what would be the second half of that Mac Pro life cycle). Not necessarily. The classic Macbook Pros are in limbo, and the Mac Mini has an infrequent update schedule. Some, not all Macs are updated predictably. So while software is pretty predictable, there are only a few Mac lines that are predictable, and iOS is all over the place. Who saw the iPod Touch refresh coming this week? That's fairly random. Not to mention there was the time Apple announced a Power Mac G4, and then cancelled it before they shipped a single one. So yeah, Apple has a colorful history of being unpredictable, especially in pro hardware. Again, it's normal for Apple products if you look at their history. Power Macs that are announced that never ship. Mac Minis not updated for a few years. This is the first time this has happened to the Mac Pro, but I can recall this happening more than a few times in the last 15 years. Again, if it's so predictable, then why the iPod Touch refresh last week? And the iPod Classic hasn't been updated in years. It's not actually very predictable. Remember the time the iPod Touch didn't get rev'd for two years and everyone was saying the iPod touch was dead? So have gone from "Apple has ever shipped something" to corner cases? Your original state still doesn't fly with these corner cases. Who saw the iPod Touch refresh coming this week? That's fairly random. It probably won't be when see that iOS 7 doesn't cover the older Touch as well but will ship before a new Touch refresh could remove the old 4th gen touch from the market. It don't think it is random at all. I strongly suspect it is associated with upcoming iOS 7 move. The motivation is likely a bit clouded right now. It is either that or some move they expect from some other vendor. ( Again wouldn't be surprising for Amazon to make a iPod space move before Apple can do a refresh in Sept and remove the 4th generation. ). The 4th gen was likely dead in September anyway. That Apple killed it a couple months early isn't a big deal. They'll probably sell more than they would have if they roll out their using "summer student special" where 'give away' iPods along with Mac systems purchases now that the entry iPod isn't a known, "doomed" item. The only thing the current iMac can't best on the Mac Pro is the dual CPU option and lets be honest: the software that can fully utilize that and the number of buyers that are willing and able to pay for that imply that's a tiny niche market at best. You forgot GPU and memory. You could say what you just did 4-5 months ago. But with supported 'real' 7950 and GTX 680. Mac Pro is still 50-100% faster in the GPU department. Whether OS X can do anything with all the power..., I know Windows can. At least for me I need a desktop GPU and will pay for the extra cores to get at it. I also don't like being forced into Apples display choices. IPS is fine but W-LED only and no RGB controls? Glass is fine for 15" laptop but a huge office mirror I need not. I know I can use an external but then more GPU power out the window. That and the 'micro' fan noise in my face. Not a besting situation on all fronts just yet. Not for the component picky folks. My friend at Apple who confirmed the leaked next gen iPad bezel was legit told me I'd be "disappointed" by what Apple had planned for the Mac Pro. I'm not sure what to make of that but we won't have to wait long for WWDC. I have a good hunch a lot of people will be unhappy, but I'm waiting to see what Apple's pitch is.